Sampling bottles come in many shapes and sizes. 120 ml (4 oz) HDPE (opaque) bottles have been the most common sampling bottle for many years. 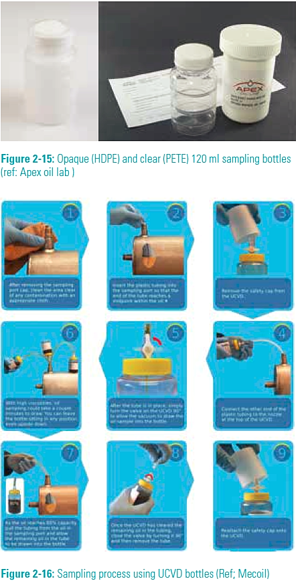 Many suppliers now provide clear PET, or PS bottles for oil sampling so end users can readily see debris or water in the sample, forcing a resample before sending it over to the testing area, or outside service provider. Bottles that are cleaned with filtered air are sold with a designation “Super clean” and are designed for applications where particulate contamination is of utmost concern. Sometimes these bottles come with a seal wrapper between the mouth and the cap. There is no standard for what is considered “clean” so it is up to the buyer to clarify what the cleanliness level is. These usually cost more than regular sampling bottles, and are somewhat ineffective, as care is needed since the bottle is contaminated immediately upon opening the cap. Some operators minimize the ingression of debris in plant environments by sampling within a polyethylene bag, however this can get very messy as the bag makes it easy for the operator to drop the sample. Misidentified sample points and samples are a very common source of confusion. 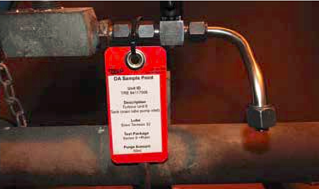 All sampling points, once identified, should be properly identified with a sign, detailing the sample point code as defined by the organization’s asset management system, and the oil brand and grade, at a minimum. (fig 17). Use preprinted asset labels from your asset management software, LIMS or service provider. • Immediately label samples. Misidentified samples are a very common source of confusion. • Use preprinted asset labels from software (e.g. oilview, SpectroTrack ) where possible. The more information present, the more meaningful the sample results will be. • What is the failure history? • How costly is a failure? In repair cost? Lost production? Life and safety? • Have operating conditions changed to put more stress on the machine? 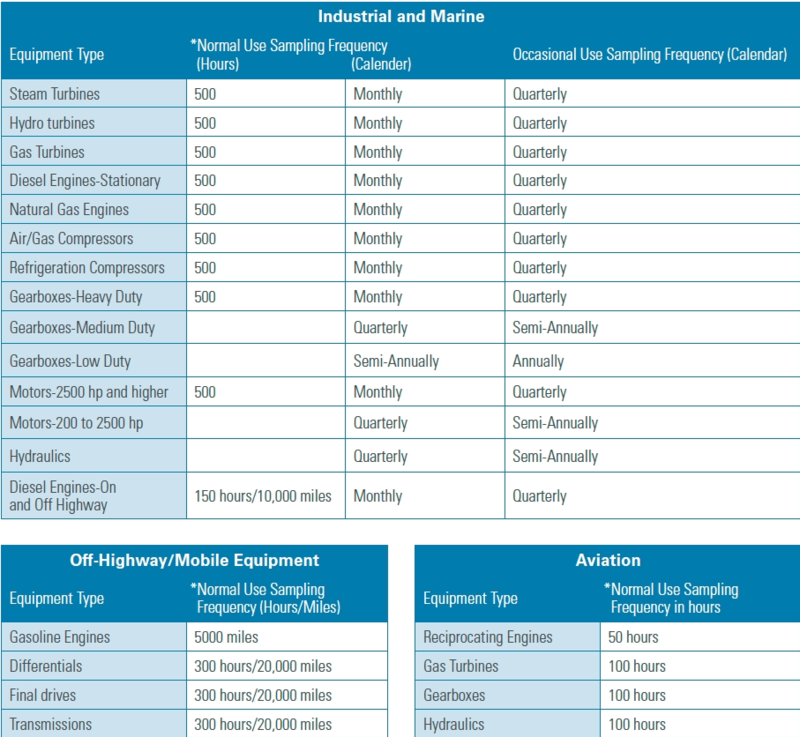 In general, a quarterly or monthly sampling interval is appropriate for most important industrial machinery, whereas reciprocating engines tend to be sampled at a more frequent interval based on run time on the oil and engine. The answers to the above questions will help decide which regimen is more appropriate. In a new program, it usually makes sense to start with a monthly interval and then extend it as experience dictates. 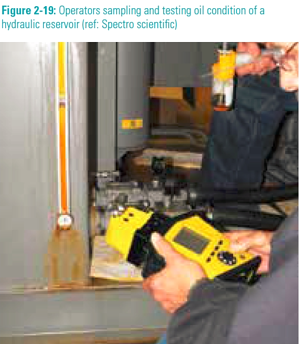 Having onsite oil analysis equipment allows the user to selfmanage and extend intervals safely as trends develop. Further guidance may be sought by consulting with the equipment manufacturer and oil supplier. The following is designed as a guide to establish proper intervals. Inspection Route based vibration analysis and thermography are standard methods of machinery health monitoring, and are now possible with oil condition monitoring. Machine oil condition monitoring yields useful and critical information on machinery health, and complements the data provided by vibration analysis. Until now, machinery inspection routes have not been able to meaningfully integrate oil condition monitoring. Only handheld data recorders were used to log lubrication management metrics such as the quantity of oil added, or the lubricant level. Actual monitoring of the oil condition was not performed because there was no technology available that provided accurate, meaningful information quickly and easily. With the FluidScan™ Q1100, it is feasible to obtain critical, quantitative oil parameters right at the sampling point, in one minute, from a single drop of oil. As a result, it is now possible to implement a routebased machinery oil condition analysis work process. The FluidScan can download all of the necessary information (Area/Equipment/Point, Oil type, and Alarm Limit sets) from the Emerson OilView program to create a route. This saves time and ensures the correct data is entered for each piece of machinery. Once the route is completed, the FluidScan measurement data for each point sampled on the route is imported into AMS so a comprehensive asset database is maintained. Route based oil analysis provides greater flexibility for on-site oil analysis programs, and provides the potential to streamline work flow processes within an industrial setting with an easy to use instrument.